Seriously interesting new study reveals that babies under six months don't react to your tickling the way you think they do. But there's still good reason to do it. It's an unwritten rule that you must tickle the tiny toes of every baby you see. 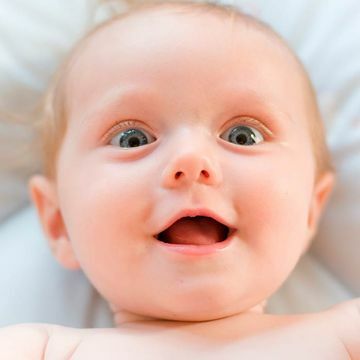 Those little tootsies are just screaming for attention, but a fascinating new study published in the Cell Press journal Current Biology, found that yes, babies squirm when they're tickled, but they don't actually know that you're the one doing it. Andrew Bremner, Ph.D., of Goldsmiths, University of London, and Jannath Begum Ali, Ph.D., of Birkbeck, University of London, tickled the crossed and uncrossed feet of four- and six-month-old infants with mechanically driven vibrations and found that at around four months of age, babies are better able to identify where they've been touched when they cross their hands or feet and someone touches them than older infants and adults. "We think [this means] that before around six months of age, human babies perceive touches just on their bodies, and not in the external world," Bremner said of the study. "If one tries to imagine what this must be like—it's a bit of a dizzying idea." While both researchers say they believe in the importance of tickling, their current research stops short of declaring that tickle touch is vital for child development. "Both Jannath and myself are of the view that multisensory experiences like tickling likely play an important role in teaching infants how their bodies and the touches they feel are related to the visual world which they see with their eyes," Bremner tells Fit Pregnancy. Instead, their research shows that something important develops between four and six months of age, but the study has not managed to directly get at the important question of how that development happens. Bremner speculates that it's possible that babies learn about how touch relates to their environment through multisensory experiences where the touch is given at the same time as a visual cue. "Imagine this scenario: A parent drawing an infant's visual attention to where they are tickling them, then the infant feels the tickle at the same time as seeing the movements of the adult's hand tickling the child," Bremner says. "Then they learn that a tickling feeling in a particular part of the body is related to a tickling movement which they see in a particular place in visual external space. That kind of experience may be what gives infants what they need to learn about where touches occur in the outside world." Like with all science, Bremner and Ali need to continue their research to make a true connection, but it does appear that tickling—and touch in general—plays some kind of important role in child development. So, go ahead and keep tickling those tiny toes!